How to fit everything I have to say into a blog post? That would be about as challenging (impossible) as trying to get round the Israel Museum in half a day…which is what we attempted this week. I’ll start by stating that it is easily the best museum I’ve been to (in terms of visitor experience and quality of exhibition space). The building consists of a series of interconnected pavilions that are accessed off a wide and gradually inclining spinal walkway along its rooftop. The exhibition spaces are generously proportioned, respectfully understated (letting the exhibits do the talking) and are punctuated every so often by luscious glass-walled courtyard gardens which introduce life and diffused light from above. And what a collection! 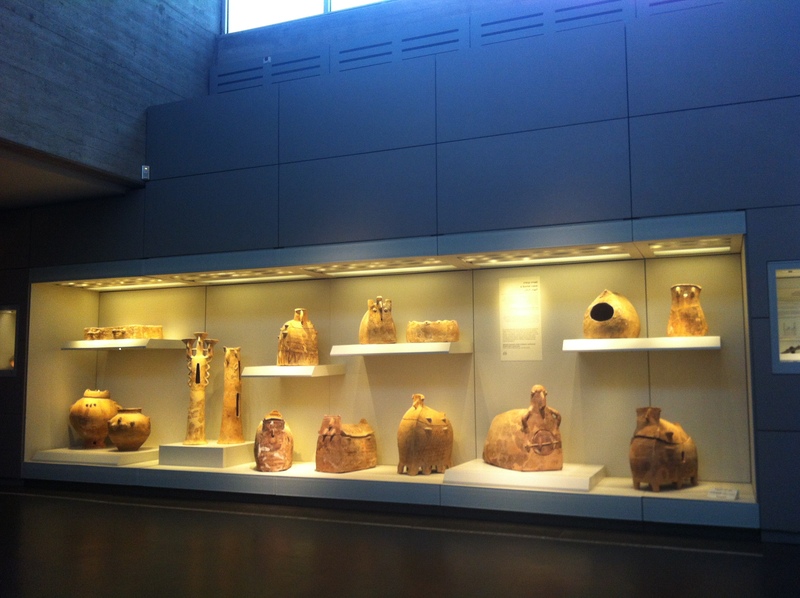 The archaeological artefacts are incredible in their diversity, quality and sheer volume. And there’s a fine art collection to die for, including numerous works by Picasso, Degas, Van Gogh, Monet, Cezanne, Dali, Rubens …and so many others (you’ll be glad to know that’s all I can remember off the top of my head!) 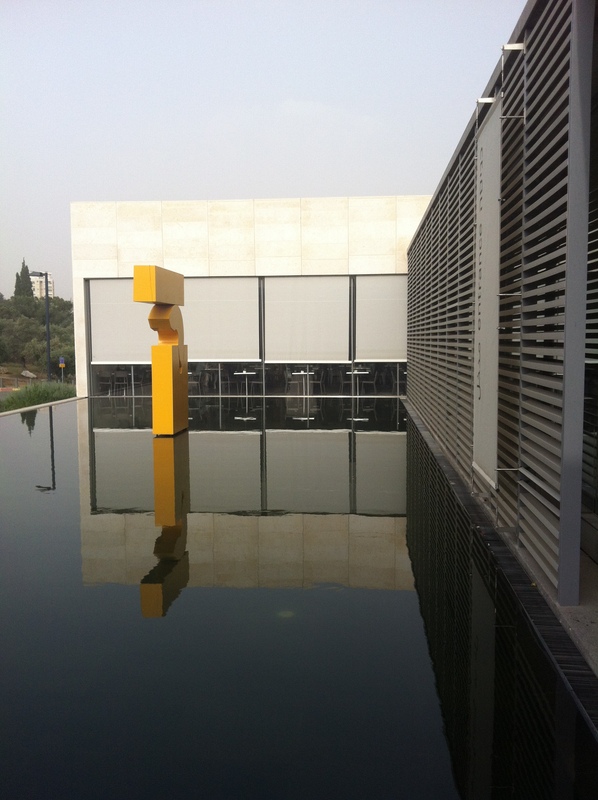 The artwork continues beyond the gallery spaces in the form of large sculptures scattered around the outdoor spaces. Image: ‘Houses for Bones’ – Ossaries (in which human bones were buried after birds of prey had eaten away the flesh during the Chalcolithic Period), had quirky faces on their lids and are thought to be shaped like the buildings of the villages. The museum has dozens of them on display. 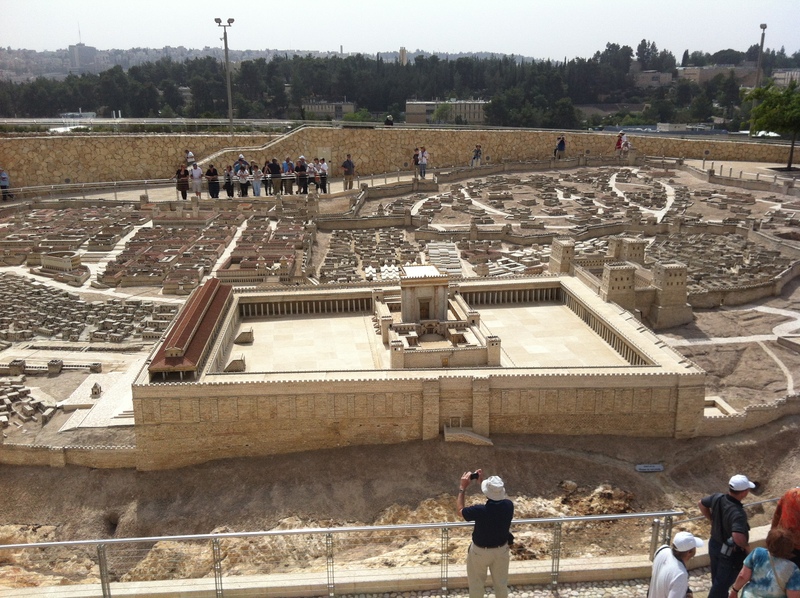 The garden also boasts a very impressive 1:50 model of Jerusalem in 67AD, the time of the (enormous) second temple (516BC), of which only the Western – or Wailing – Wall remains today. The model is made of stone with gold leaf detailing and miniature roof tiles, and is enormous. It was commissioned by the owner of Jerusalem’s Holylands Hotel in 1966 and stayed there until 2006 when it was cut into 1 metre squares and transported to the museum. 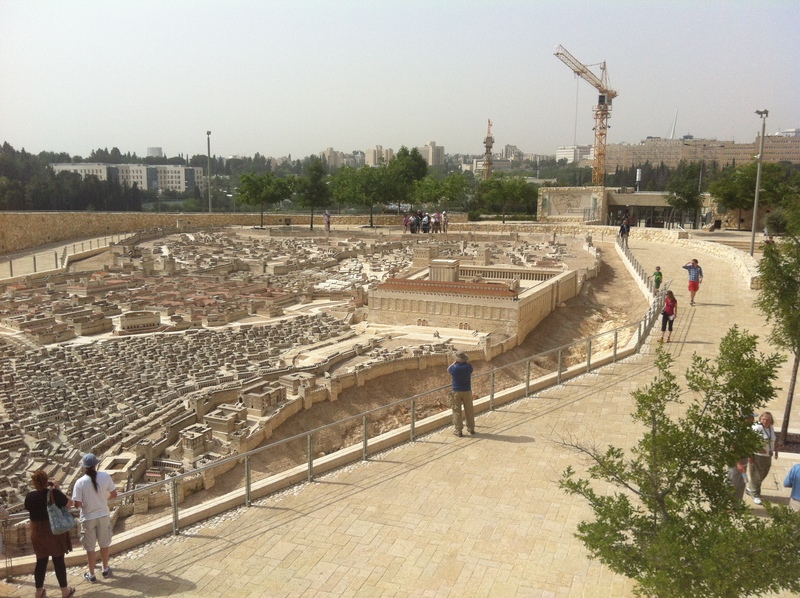 It was interesting to listen to the way in which the model was presented by our Jewish guide. She emotively described bringing her 5 year old granddaughter to see the model (“My granddaughter then said she wanted to see the real temple. She’s only 5. It’s such a shame!”) before dismissively mentioning the (Islamic) Dome on the Rock that stands in the place of the temple today, adding that “they” had “apparently” found a footprint thought to be left by Muhammad before he ascended to the heavens from that spot. 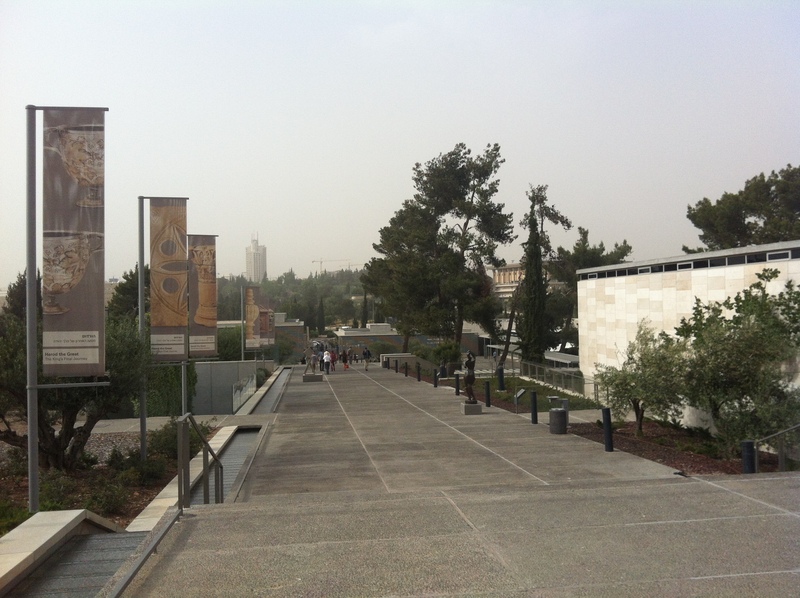 But it’s not called the Israel Museum for nothing. 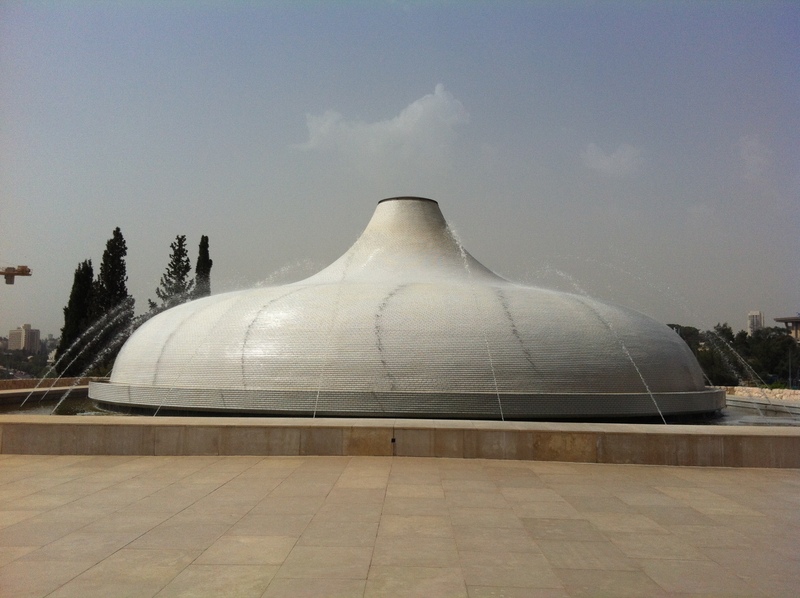 For me the highlight of the museum was the Shrine of the Book – a building designed with the sole purpose of housing and exhibiting the Dead Sea Scrolls (the earliest biblical writings on earth, found within caves at the Dead Sea in 1947-56). It was constructed in 1965, designed by architects Armand Phillip Bartos and Frederick John Kiesler. And it looks like it could have been designed yesterday. This project has the conceptual and symbolic purity of the best student architecture projects, which are often compromised in the ‘real world’ due to budget, time, structural and space constraints, to name but a few. The route through the exhibition is an emotive and metaphorical journey representing both the contents of the scrolls and the place that they were found. A black wall and a white, water-soaked dome (which seem to be separate from above but are connected underground) sit in sculptural dialogue with one another, representing ‘The Sons of Light’ and the ‘Sons of Darkness’ from one of the manuscripts in the scrolls. You enter the building underground, along a dark, narrow passage that evokes the caves in which the scrolls were found (unfortunately no photography is allowed inside). The scrolls (mainly replicas are on display because the originals are so delicate) are located within the white dome, a sanctuary whose shape is inspired by the lids of the jars in which the scrolls were found. The potential for anti-climax is great when all there is to see is a few bits of parchment (I’m thinking, for example, of the small and slightly disappointing Mona Lisa at the Louvre). But this is fully mitigated by the drama and tension that is created through the architecture and the journey – the experience is deeply atmospheric, even to someone like me who was fairly disinterested in the scrolls themselves. Of course nothing is apolitical in Israel. 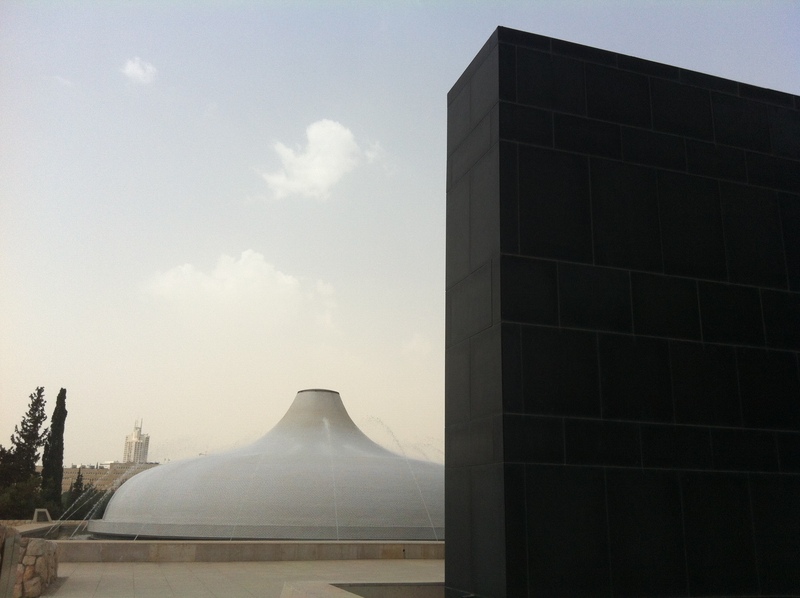 Samuel Jacobson suggests on ArchDaily that both the Israel Museum and the shrine within it are political instruments of the Israeli state; ‘Like the new Israeli State, the Shrine emerges suddenly from tectonic depth to solidify into monolithic form; autonomous, finite, timeless, and eternal. Like the Israeli people, the Shrine is an enigmatic thing, surrealistically landed in the desert garden of the Museum to mediate between the retreating past and unknown, unbounded future.’ He then goes on to quote one of the architects, Kiesler, saying that there was ‘no symbolism intended’ in the building. Yeah right – it’s one of the most symbolic buildings I’ve ever seen! Just for fairness sake one could comment that the construction of the Dome of the Rock on the exact same location of the Temple was political. Also, the Christian church inserted into the mosque in Cordoba, spain. People through religion all too often expose their basest. Indeed, we might push this further with the statement ‘there is nothing apolitical about religion’. Religion (whatever form it may take) has always got something to say about how we want the present/future political reality to be. This might be a really positive thing or it can, as Richard Dawkins and others regularly point out, be absolutely terrible. Too often it seems in global history, nowhere more so than in Jerusalem, appeals to the transcendent have been used to justify the imperial and colonial desires of particular groups. This seems to me repugnant, particularly when something as powerful and self-interested as a state is the protagonist. There is little we can do to change history but much we can do to shape the present and future.